In English grammar, a root is a word or portion of a word from which other words grow, usually through the addition of prefixes and suffixes. By learning root words, you can decipher unfamiliar words, expand your vocabulary, and become a better English speaker. Most words in the English language are based on words from ancient Greek and Latin. The root of the word "vocabulary," for example, is ​voc, a Latin root meaning "word" or "name." This root also appears in such words as "advocacy," "convocation," "evocative," "vocal," and "vowel." By dissecting words such as these, etymologists can study how a word has evolved over time and tell us about the cultures they came from. Root words are also useful for creating new words, especially in technology and medicine, where new innovations occur frequently. Think of the Greek root word tele, which means "far," and inventions that traverse long distances, such as the telegraph, telephone, and television. The word "technology" itself is a combination of two other Greek root words, techne, meaning "skill" or "art," and logos, or "study." The table below defines and illustrates 25 of the most common Greek roots. 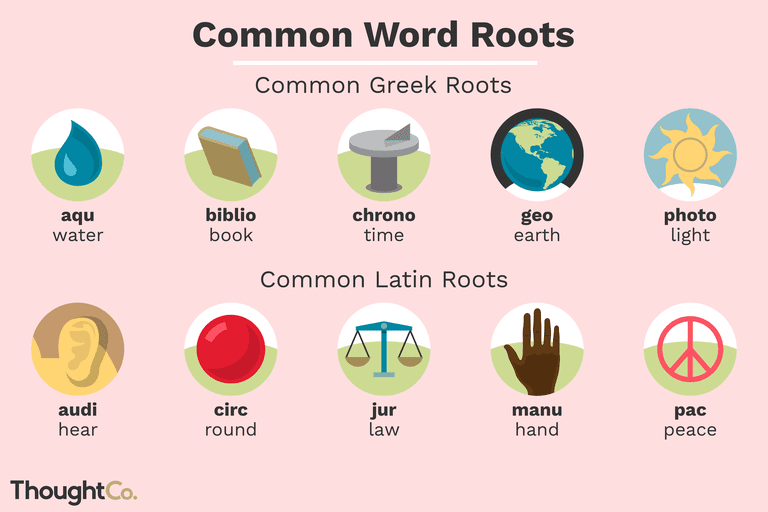 The table below defines and illustrates 25 of the most common Latin roots. ​Understanding the meanings of the common word roots can help us deduce the meanings of new words that we encounter. But be careful: root words can have more than one meaning as well as various shades of meaning. In addition, words that look similar may derive from different roots. Bryant, Alice, and Robbins, Jill. "Grow Your Vocabulary by Learning Root Words." VOANews.com, 28 November 2017. Grammarly staff. "Why You Should Learn Roots." Grammarly.com, 6 February 2016. McCammon, Ellen. "50 GRE Words You Should Know." PrepScholar.com, 8 February 2017.